No contract. Use your own device - activate any T-Mobile phone, AT&T unlocked phone, Apple iPhone, Android, Windows, any compatible GSM cell phone or other compatible tablets. Ready to use. Activation Code included. Plan includes Unlimited Talk + Unlimited Text and effective April 5 2018 plan is upgraded to 2GB high speed data for 30 days. No contract. No credit check. No activation fee. Taxes included. Keep your existing phone number or get a new phone number. Easy activation. Our SIM card is TRI-CUT, Standard SIM, Micro SIM and Nano SIM. Just punch out the size you need for your wireless device. Our service will work within the United States in partnership with T-Mobile network. Roaming is not supported in our plans. NOTE: After SIM activation, it might take up to 24-hours for the GPRS and data settings to sync and update with your device. Make sure you turned on the power in your device, in a good reception area. Unlimited Voice & SMS Services UNLIMITED DOES NOT MEAN UNREASONABLE USE. UNLIMITED Voice & SMS services are provided solely for live dialog between two individuals for personal use only. UNLIMITED Voice & SMS services may not be used for Business, Enterprise , Commercial use etc. Full terms of service can be found on out website. 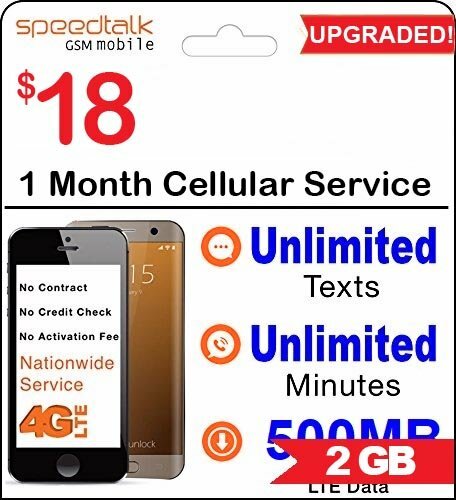 Plan includes Unlimited Talk & Text and effective April 5 2018 plan is upgraded to 2GB high speed data for 30 days. Triple cut SIM card. Standard SIM, Micro SIM & Nano SIM card. Punch out the size you need. Use your own device - Activate any T-Mobile phone, AT&T unlocked phone, Apple iPhone, Android, Windows, any compatible GSM cell phone or other compatible tablets.